Schematic summarizing the relationships between the Kelvin waves and tropical cyclogenesis observed in this study at (a) 200 and (b) 850 hPa, and (c) in a time–longitude cross-section. A new study by Carl Schreck III of the North Carolina Institute for Climate Studies and North Carolina State University provides important insights into the way long-lived tropical weather patterns known as Kelvin waves influence the development of tropical cyclones. The findings are already being used by NOAA’s Climate Prediction Center and National Hurricane Center in forecasting tropical storm development. Atmospheric Kelvin waves are tropical rainfall systems accompanied by distinctive westerly and easterly wind patterns. These waves move eastward around the Earth and can circumnavigate the tropics over the course of a month. Even though they are some of the most prominent systems in the tropics, their eastward movement limits their ability to interact with the westward-moving developing tropical cyclones. As a result, their effects on tropical cyclogenesis have remained an unanswered question to this point. Schreck’s study examines the effects of Kelvin waves on tropical cyclone formation around the globe, and concludes that fewer storms develop in the three days leading up to the Kelvin wave’s maximum rainfall, while more storms form in the three days afterward. These results are broadly consistent with recent studies in the Atlantic, but this study extended the relationships to other basins. 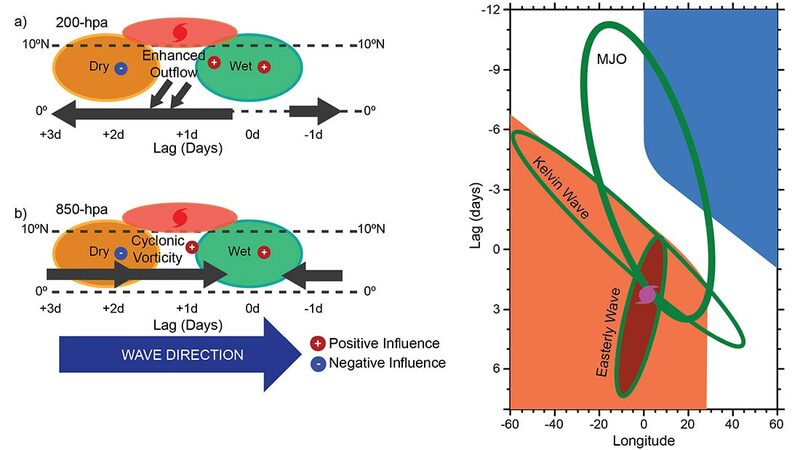 The schematics in Figure 1 summarize how Kelvin waves impact developing tropical cyclones. The maps on the left show that low-level westerly and upper-level easterly wind patterns associated with Kelvin waves persist several days after the Kelvin-related rainfall has moved eastward. The low-level westerlies enhance the cyclonic vorticity, and the upper-level easterlies might enhance the outflow. The time–longitude schematic on the right shows how the Kelvin waves interact with a larger-scale phenomenon known as the Madden–Julian Oscillation (MJO) and with easterly waves to initiate genesis. The Kelvin wave’s rainfall (green contour) moves eastward with time. Along with the rainfall, the low-level easterlies (blue) recede and the westerlies grow (red). These often occur within the MJO’s broader transition from westerly to easterly, but the Kelvin wave speeds up this transition. A new finding of this study is that an easterly wave signal also appears to initiate or intensify within the Kelvin wave’s rainfall. This easterly wave ultimately gives birth to the tropical cyclone. Kelvin waves often last for weeks and can travel all the way around the world, so these results could improve long-range forecasting of tropical cyclones. Forecasters at NOAA’s Climate Prediction Center and National Hurricane Center are already putting these findings into practice for their predictions. In particular, they use web-based Kelvin wave and tropical cyclogenesis tracking tools developed by Schreck (available at monitor.cicsnc.org/mjo) to anticipate tropical cyclone activity. This web page includes maps and time–longitude plots that use data from the daily outgoing longwave radiation Climate Data Record and the Climate Forecast System to identify and predict these waves. They were used to forecast the formation of several storms in 2015, including Hurricanes Danny and Joaquim.